The Wine Server allows perfect, non-drip pouring every time! The Wine Server catches any drips before they stain your table`s surface.The Wine Server can also be used in conjunction with the stoppers of the Vacuum Wine Saver. 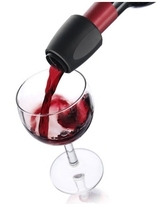 The Vacuum Stopper can easily be inserted into the Wine Server, allowing you to preserve the wine you did not serve.